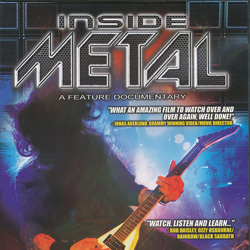 The next step on the journey started with last year’s double DVD set ‘Inside Metal: Pioneers Of LA Hard Rock And Metal’, ‘Inside Metal: The LA Metal Scene Explodes’ throws the spotlight on the period in the early Eighties when all of a sudden everything metal centralised itself on the City of Angels. How and why this happened is brought into sharp focus by pretty much a cast of thousands including the likes of Betsy, Lizzy Borden, John Bush, Don Dokken, Dave Ellefson, Stephen Pearcy, Marq Torien, Lars Ulrich and Joey Vera. Again a double set (but sold separately) and again a true testament to a group of people keen to document an important part of metal’s history, ‘…The LA Metal Scene Explodes’ is eminently watchable, nicely filmed and edited, and offers a tremendously engaging insight into what it was like to observe and/or be a part of the global rise of the LA metal scene as it took over from the NWOBHM (which, it is noted, had a “significant impact” on LA metal) in particular and the Brits in general. The first DVD is perhaps more band-centred, while the second looks more at the environment in which the scene expanded, but of course these are both are co-dependent and completely inseparable anyway – like the chicken and the egg, without one the other is irrelevant. Grainy film from the time wipes away the façade of glamour that you associate with the pristine and well-preened LA acts of the time – a toilet gig’s a toilet gig, wherever you are in the world! – but sets the scene as numerous bands slog their way around LA’s many (and world-famous) clubs. With three hours’ footage loving assembled and narrated over the two DVDs there’s a lot to enjoy and a lot to learn, too, although for my money the link between the NWOBHM and the LA scene in the first DVD and the fracturing of the LA scene into sub-genres which suddenly not only lacked cohesion but actually discouraged it in the second make for interesting discussions. For those too young or whose memory has faded, John Bush enumerating how many bands inked deals shows just massive the scene was before some kind of fall-out became inevitable; and, although tangential, Mitch Perry’s three reasons why he quit drinking is hilarious. If you’re hooked it’s worth noting that to wrap things up neatly next year sees the final part of the trilogy with the inevitable ‘Rise of LA Thrash Metal’ as well as a complementary documentary about the Bay Area thrash movement.